2018 Fairline Grand Turismo 48-529 available for immediate delivery. 3 cabin, high gloss walnut timber & galley up configuration. Look beyond the exciting, sun-appreciating nature of this sports cruiser and you will find new technologies and exceptional engineering. The hull, for instance, has been specifically designed to complement the Volvo Penta IPS engines, resulting in even more precise handling, along with impeccable sea keeping. Taking the hardtop in question, it comes with panelled glazing as standard for that 'open, even when closed' sensation. 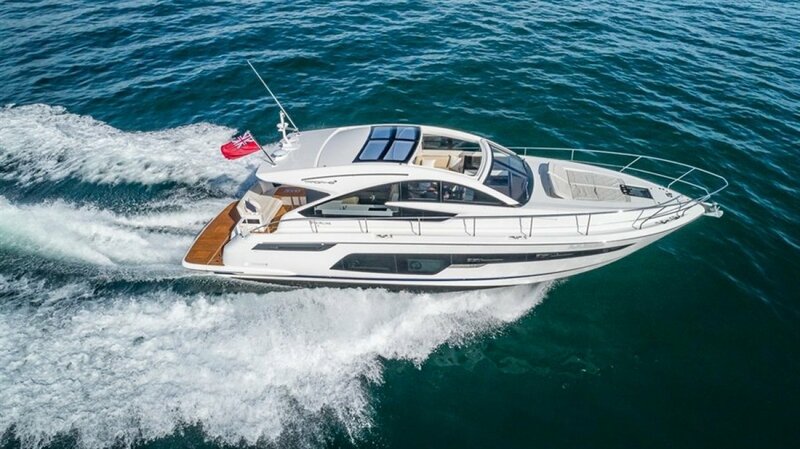 Moving through the boat you'll find a luxuriously spacious, sociable upper deck that offers plentiful seating, in addition to a well-appointed helm station with twin seats. The cockpit features a J-shaped seating area with a table, and can offer the option of a sunbed conversion. The lower deck has three cabins and a galley raised in the saloon. Perfectly formed, perfectly thought-through. Everything you come to expect from a Fairline.